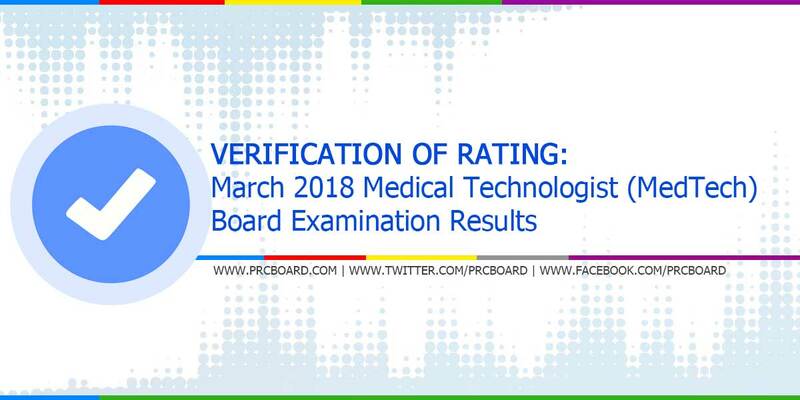 MANILA, Philippines - The verification of ratings and test results for the March 2018 MedTech licensure exams given by PRC Board of Medical Technology will be available online few working days after the posting of results. To keep updated on related news and announcements about March 2018 MedTech board exam results, we advise our readers to visit PRC official website or follow us at our social media accounts via Facebook and Twitter. kailan lalabas yung average score? ilang days ba after lalabas ang averagescore? I've been trying to check if the ratings are out. However, the only recent verification is for Aug 2017. When can we view for March 2018? Thank you.